Categories: Business, Doug Lapins, Leadership, Management. Awarded with the Silver Medal during the 2015 Axiom Business Book Awards the first edition of Sweet Success received a great success. In this revised second edition the former CEO, Douglas Lapins chronicles the changes and challenges of a thirty-year career in the corporate world. 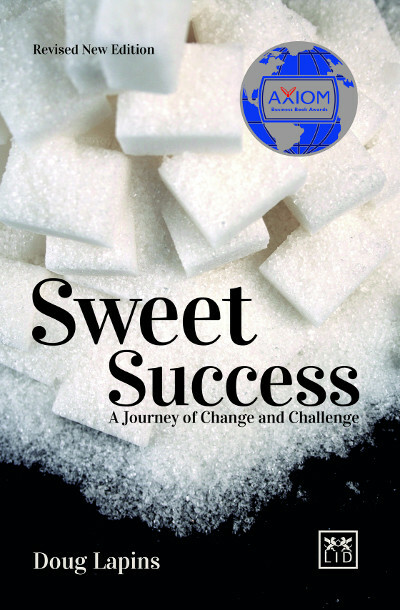 High-fructose corn syrup, a changing sugar industry, and practical leadership methods weave an absorbing tale of business, family, and social responsibility. Through strength of character, hard work, and native intelligence, he embraced a life full of extraordinary experiences and growth. This is the engrossing story of that journey, the people who influenced its path, and lessons that were learned. It is a must-read for anyone on their own journey of self-improvement. An engrossing read about the challenges of a thirty year career in the corporate world. ● This is a book that chronicles the personal and professional obligations from a former CEO. ● Blending personal narrative with business insight, the author takes us on his journey of growth and corporate success. ● The first edition of the publication was awarded the silver medal by the 2015 Axiom Book Awards.